Would a mega-murderous, universe-killing snap by any other name sound as harsh? After the shocking events that played out in the final moments of Avengers: Infinity War — you know, when Thanos (Josh Brolin) powered up the Infinity Gauntlet, then snapped his fingers and wiped out half of all living creatures across every galaxy in existence? 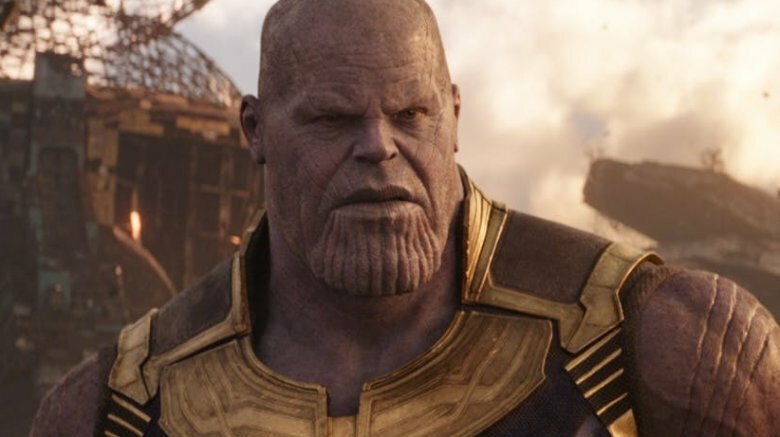 — Marvel fans have been at a loss for what to call the Mad Titan's horrifying act. While most have referred to it as "the Snap" or by the more creative name "the Snappening," Marvel hasn't given the moment a legitimate moniker. Thanks to the publication of the most recent Avengers: Infinity War tie-in novel, The Cosmic Quest Volume Two: Aftermath by Brandon T. Snider, Thanos' snap has an official name — and it's a brutal one. To those who survived being murdered by the Mad Titan, the act is known as "the Decimation" (via ComicBookMovie.com). While the Avengers and company clearly know all the heartbreaking circumstances that surround the moment — the vigilantes joining forces in battles across the globe, several heroes making incredible sacrifices, and many crumbling away to dust, some in each other's arms – non-superpowered humans spared by the Decimation won't know the truth. In The Cosmic Quest Volume Two: Aftermath, the Avengers have concealed the truth from the rest of humanity, believing that revealing the fact that a single person was responsible for taking the lives of billions of people would "hardly help the world to heal." No one but Earth's Mightiest Heroes and the band of Marvel vigilantes involved with the event know what actually happened; everyone else is only aware that most people in the world have vanished without a trace, and aren't aware of the reason why. For comic book fans, the name "the Decimation" should ring a big bell. In the Marvel source material, the moniker was previously employed to refer to the aftermath of the event that happened in the "House of M" storyline, which featured Scarlet Witch (played in the Marvel Cinematic Universe by Elizabeth Olsen) stripping powers from 90 percent of the world's mutants. The "depowered mutants" suffered terrible fates after Scarlet Witch wiped away their abilities, with some committing suicide after losing their identity and others fading away and eventually dying without their powers. As Screen Rant pointed out, Thanos' snap and Scarlet Witch's power-clearing are incredibly similar to one another: "both were initiated by a single being, transformed the world in one tragic instant, led to widespread suffering and grief, and were kept secret by the heroes." Though it's fitting that The Cosmic Quest Volume Two: Aftermath would pluck "the Decimation" name from the Marvel comic canon given its similarity to the aftermath of the "House of M" event, it remains to be seen whether Marvel Studios and directors Joe and Anthony Russo will implement the name in Avengers 4, or if the heroes will, as they have done in the comics and this new companion novel, keep Thanos' snap a secret from humans. The name works flawlessly: Thanos really did decimate – "destroy a great number or proportion of" – the universe in the seconds after he felt the rush of the fully-charged Infinity Gauntlet. And it makes total sense why the heroes who made it out alive would want to save others from the trauma of the full story. But will fans hear that name and witness that secret-keeping in Avengers 4? We don't feel like we're reaching in saying that it's possible, but knowing Marvel, anything can happen. At the time of this writing, the studio has yet to announce the film's official name and is still (reportedly) a day away from dropping the first Avengers 4 footage – which could end up just being a 10-second teaser that shows nothing but a black background, the dusty remains of our fallen heroes, and the film's title and release date. Marvel also holds Avengers-related details in near-impenetrable lockboxes, so to make any confident declarations about the contents of Avengers 4 would be silly. At the end of the day, Marvel is to any and all Avengers 4 information as Rick Astley is to, well, you: never gonna give it up. Fans can find out what Thanos' snap will be called (if anything) in Avengers 4 when the film opens in theaters on May 3, 2019.